One of our finest contemporary historians and a hugely respected academic and author, Peter Hennessy has a wealth of knowledge and experience to draw on and uses it to illuminate his own appreciation of Britain’s postwar experience. 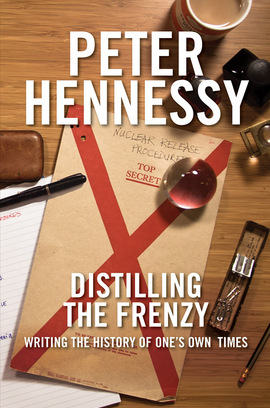 Distilling the Frenzy examines Britain’s place in the world – the perceived diminution of its power as well as its remaining potential for influence; it also dissects the networks and operations that underpin national policy while at the same time offering insights into the public actions and hesitations of individual Prime Ministers from Attlee to Cameron. In this updated edition, which uses new material released from government archives, Hennessy provides an expert account of the constitutional factors in play if the electorate produces a hung parliament in 2015. An independent crossbench peer, Hennessy brings to bear his singular perspective on postwar British history using a whip-smart, vivid turn of phrase that energises events on each and every page. Lord Hennessy of Nympsfield is the Attlee Professor. This fascinating and lucidly written book derives from a series of lectures given by the author in 2011… It also provides a useful canter through British defence reviews, those fraught and contentious battles over strategy, equipment, and resources. Hennessy is a master of the spoken, as well as of the written, word deployed in relaxed, conversational style.